SWEDEN I SEE? FRANCE? UK? We apparently have like, a few viewers from different countries. FREAKING SWEET! Hey friends! Can you read this page! Does it change languages!? Who cares, I love you guys! Last night (December 5) a white male was shot down in the middle of a crosswalk. 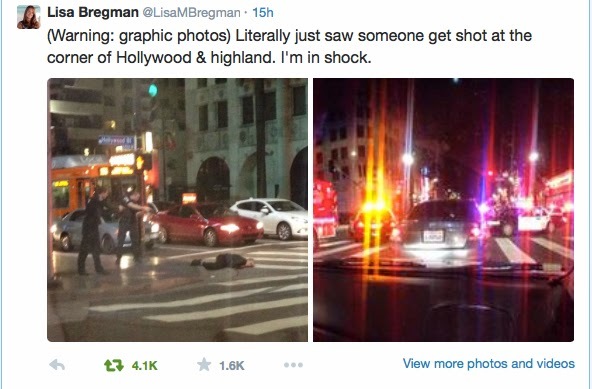 In a tweet by Lisa Bregman, she witnessed the shooting and caught a photo of the aftermath. We are trying to get an interview or eye-witness account from Lisa but she has yet to respond. Another witness, Jordan White, says that the man was unarmed. This goes against the police reports saying that he had a knife. No identities have been released yet. 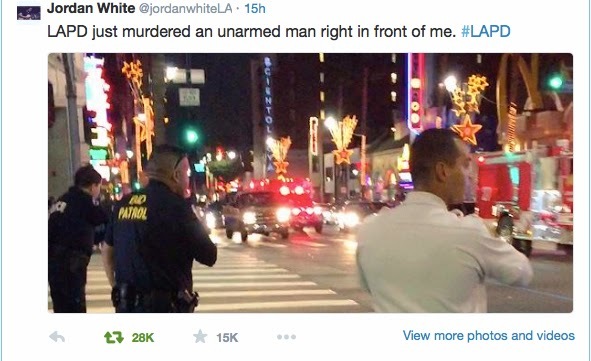 Picture by Jordan White 12/5 at 9:01 PM, currently has 28,000 Retweets and 10,000+ Favorites. A black male, Rumain Brisbon, was shot and killed after Arizona Police mistook his pill bottle for a handgun. The officer and Brisbon ran into a building after Brisbon ran away from the officer after exiting his car to look for something in the trunk. The officer took off after Brisbon and the fight could be heard from residents of the apartment building. Brisbon was shot after the officer thought he was going to pull a gun out in front of two kids. Brisbon was shot in the back two times and the officer walked away. The identity of the officer has not been identified. One of Brisbon's daughters, 9- year-old Aiyana, sent a heart-breaking letter to the officer that states, "He's not going to be here to see the happiness of us and the sad. He not going to see his little girls grow up. Why did you have to shot him two times in the back?" If you are not concerned about why the police are killing people, not to mention TWO PEOPLE WITHIN LESS THAN A WEEK APART there is something seriously wrong with you. There are of course, two points of view from this story, but either way you spin it, something wrong has happened. As said by Ann Hart, the chairwoman of the African American Police Advisory Board for South Phoenix, "We need to take a deeper dive into why police officers are feeling compelled to shoot and kill as opposed to apprehend and detain, arrest and jail." The amount of force being used by police when there are many safer alternatives is so disturbing to the public eye. Cutter and I were enjoying a nice game of Madden 15 on the Xbox One until we both got disconnected. Everything was connected to the internet, and we restarted our internet as well just to make sure. After about an hour of trying, we just gave up and thought that it may have been down for maintenance. Cutter went to the internet and said- "People everywhere are saying it's down. Someone said Xbox got hacked." I told him that that probably wasn't the case, and we just gave up and went to bed. Before I fell asleep though, I came across some interesting things. 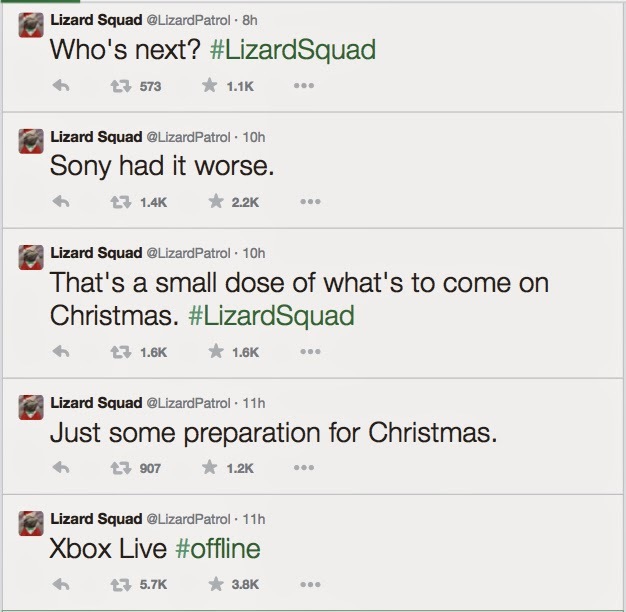 Earlier this summer, they attacked XBL, PSN, League of Legends, and Battle.net! They then targeted Twitch and placed a BOMB THREAT to ground a Sony executive's flight! Hopefully they will be stopped sooner or later, and players will not have to play offline this Holiday Season. WHAT DO YOU THINK OF THIS? LEAVE IT IN THE COMMENTS BELOW! Don't forget you can contact us on twitter here @FractionOverby or @OverbyNetworks or Google+!